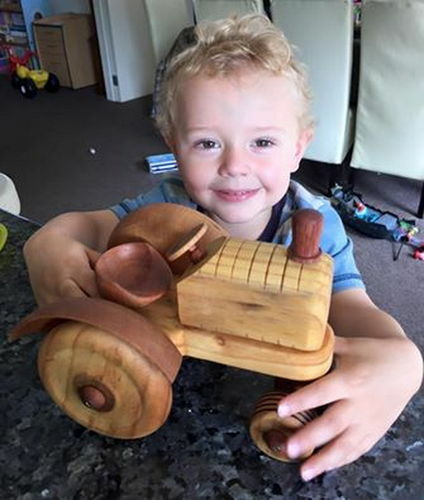 Toy Tractor Made from Rimu and Jarrah. Tony…..His smile says it all. Great tractor. The smile is worth any effort required…. I just showed these photos to my wife, and we both agree . . . the little guy’s smile is wonderful. You hit the Jack pot with this one, that smile is priceless. Now that’s a happy little guy! Great job and should last for decades too! I really like toys that can be really PLAYED WITH! That smile tells the entire tale. Good on you for providing it. Very cute tractor. Isn’t that smile priceless!? Keith, That is a pretty cool tractor. A smile on a child’s face is payment enough. Great job! Yes sir, the smile on the little bloke says it all…Top Job Keith!